Denver, CO – A crowd of more than two hundred Stock Show attendees and supporters gathered Thursday evening as the Red Meat Club of Denver recognized Bill Waneka of Wheatland, Wyoming as the 2018 recipient of the Friend of the National Western Stock Show and Red Meat Industry Award. Born and raised on the Waneka family’s centennial farm just east of Lafayette, Colorado, Waneka has been a Stock Show leader and volunteer for nearly 50 years, beginning when he was first hired as an assistant livestock superintendent in the early 1970s. Bill led the National Western’s Catch-a-Calf program for 35 years, continuing today as an active committee member and participant sponsor, and served for decades on the Junior Livestock Auction Committee. The National Western Roundup kicks off the National Western Stock Show by hosting some of the top livestock judging teams from across the country, including the team from Colorado that earned third place honors in the state contest last June. The four-person team from Morgan County, coached by Susan Kendrick, walked away from Denver as Reserve Champions. Westminster, CO (January 12, 2018) – The nearly bison 500 ranchers and marketers headed to Denver next week will bring with them more than 135 head of live bison and a wave of optimism as they prepare to gather at the National Bison Association’s 23rd annual meeting at the Denver Renaissance Hotel, and at the association’s Gold Trophy Show and Sale at the National Western Stock Show. WASHINGTON, D.C., Jan. 12, 2018 – The U.S. Department of Agriculture today finalized a regulation that will allow all Mexican states to export pork to the United States, a move supported by the National Pork Producers Council. USDA’s Animal and Plant Health Inspection Service (APHIS) is implementing a science-based risk assessment that determined Mexico is free of Classical Swine Fever (CSF), highly contagious viral disease in pigs. It was eradicated from the United States in the late 1970s. APHIS in 2016 concluded that the risk of CSF from pork imports from Mexico is negligible. 01-12-18 WDA: Don’t Miss the Colorado Farm Show’s Dairy Day! WDA: Don’t Miss the Colorado Farm Show’s Dairy Day! The select eight members of CSU’s Seedstock Merchandising Team, in the Department Animal Sciences, gains one-of-kind industry experience through their year-long training at the university. The team raises bulls selected for specific characteristics, and these bulls are sold to commercial ranchers who use them to get their cows pregnant and generate calves for the beef industry. For more than a decade, the Seedstock Merchandising Team has overseen the selection, development, and marketing of these genetics. The students who make up CSU’s Seedstock Team actively market bulls and heifers via a production sale scheduled for February 2019. This allows for a real-world, hands-on learning environment and an opportunity for students to network within the beef cattle industry. CSU’s Seedstock Team will be showing their cattle at the National Western Stock Show Friday, Jan. 12 and Saturday, Jan. 13 at 8 a.m. at the Livestock Center Auction Arena. WASHINGTON, D.C., Jan. 8, 2018 – The Trump administration today unveiled its blueprint for spurring rural development and prosperity, which includes efforts supported by the National Pork Producers Council. Speaking at the annual meeting of the American Farm Bureau Federation in Nashville, the president revealed recommendations from his Ag and Rural Prosperity Task Force, including ones addressing the agricultural labor shortage, expanded broadband access for rural areas and regulations that have put a damper on the farm economy. Preparations are well underway for the National Farmers Union 116th Anniversary Convention, to be held March 4-6, 2018, at the Westin Crown Center Hotel in Kansas City, Missouri. The convention provides NFU members and attendees the opportunity to learn, collaborate and grow through thoughtful discussions, breakout sessions and farm tours. We are pleased to offer attendees new learning opportunities this year while maintaining a focus on the issues that matter most to our family farmers and ranchers, such as the economy and defending the farm safety net. Earlier this week at the American Farm Bureau Federation’s annual convention in Nashville, Tennessee, NFU President Roger Johnson sat down with AFBF President Zippy Duvall to discuss the two organizations’ new Farm Town Strong campaign. The campaign is meant to raise awareness of extent of opioid addiction in farming communities and engage the strength of those communities to overcome the crisis. 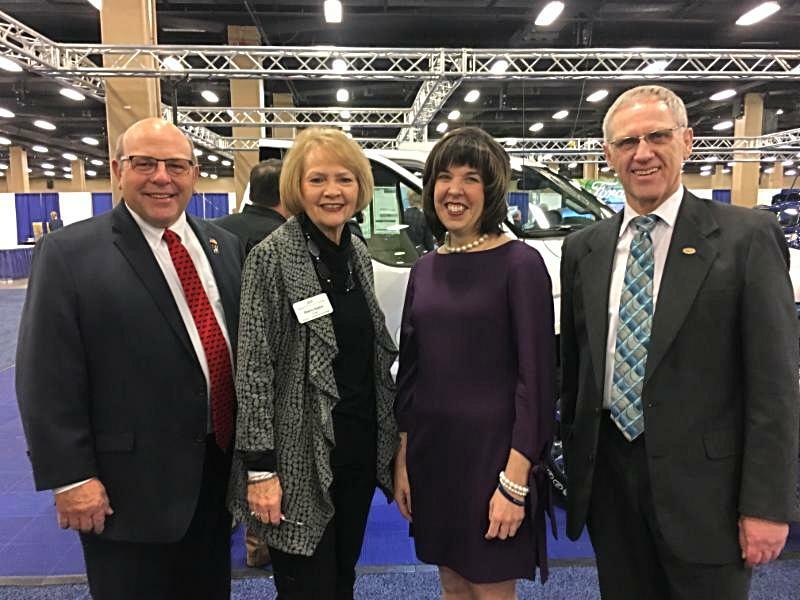 Duvall and Roger were joined by Anne Hazlett, who, as Assistant to the Secretary for Rural Development, leads the U.S. Department of Agriculture’s efforts in addressing opioid abuse. Sherry Saylor, AFBF’s Women’s Leadership Chair, moderated the conversation. Watch a video of the full session here. In addition to raising awareness, the campaign will also provide resources and information to help farm communities and encourage farmer-to-farmer support to overcome the crisis. This includes the launch of a new website, FarmTownStrong.org, which provides easy access to information and resources that can help struggling farm families and rural communities. Learn more about the campaign in this NFU release and find more resources at FarmTownStrong.org. From left to right: Zippy Duvall, Sherry Saylor, Anne Hazlett, and Roger Johnson. separately to avoid disclosing data for individual operations. totaled 7.41 million bushels, down 1 percent from last year. Registration is required and the fee is $10. To register online go to https://sterlingagoutlook.eventbrite.com . Space is limited and the registration deadline is Friday, February 9th. On a bright, early fall day in 2017, members of the Colorado Basin Roundtable stood on the banks of the Colorado River watching water slide smoothly over the Bill and Wendy Riffles near Kremmling. Willows glowed gold on the banks, and new sprouts poked up through the cobble at the water’s edge. The 2018 Angus Foundation Heifer Package commanded a resounding $215,000 at the National Western Angus Bull Sale. Thank you to both the gracious donors, VINTAGE ANGUS RANCH of Modesto, California and the generous buyers, Lylester Ranch of Martel, Nebraska for their outstanding contributions to the Angus Foundation. Since 1980, the Angus Foundation has sold high-end heifers in the Heifer Package to generate funds for Angus youth, education and research efforts. The tradition continued at the 2018 National Western Stock Show (NWSS) in Denver, Colorado, on Wednesday, Jan. 10 during the Angus Bull Sale. Angus breeders continued to exceed the challenge of pushing the breed further through their generous support of the Foundation Heifer and confirmed heifer pregnancies. This year, the Angus Foundation raised $278,000 in support of the Angus breed’s future. Dan and Patricia Vergith of Lylester Ranch, Martell, Nebraska, bought the Angus Foundation Heifer Package, Vintage Blackbird 7184, for $215,000 in a packed historic Stadium Arena. Canada is becoming more convinced that President Donald Trump will soon announce U.S. intentions to withdraw from the North American Free Trade Agreement. President Trump told reporters at the AFBF annual convention earlier this week that he is negotiating tough for farmers, but did not rule out the possibility of withdrawing from the agreement. While the administration seemed to attempt to reassure farmers that the renegotiation will be completed and be better for agriculture, it appears Canada is calling it a bluff. A top unnamed government official from Canada told Reuters: “The government is increasingly sure about this…it is now planning for Trump to announce a withdrawal.” Negotiators from the NAFTA partner nations are due to meet for a sixth round of talks starting January 23rd, in Canada. Be it a threat, or intention, if President Donald Trump starts the withdrawal process from the North American Free Trade Agreement, Mexico will drop the trade pact. If Trump decides to leave NAFTA, he would trigger a six-month process to withdraw from the agreement. An official from Mexico said this week that if Trump announces a U.S. withdrawal from NAFTA, “at that moment the negotiations stop.” AgCanada reports that Mexico remains firm on its position to get up and leave from the negotiating table if Trump goes through with the move. While a NAFTA termination letter would start the six-month exit clock ticking, the U.S. would not be legally bound to quit NAFTA once it expires. Washington could use the move as leverage over Canada and Mexico in talks to update the 24-year-old trade pact. The Kansas City Federal Reserve Bank says the outlook for agriculture remains down, but is beginning to show signs of stabilization. The bank notes that while aggregate measures of farm income are significantly lower than in previous years, the farm income forecast for 2017 was relatively unchanged from the 2016 estimate. Although farm income was expected to stabilize, growing inventories and trade uncertainty remain key risks to the outlook. High yields boosted production of corn and soybeans to near-record levels for the fourth year in a row, creating higher inventories and an expectation of prices holding at lower levels. Alongside growing domestic supplies, demand from exports and international trade have become more important, but agricultural producers and bankers have expressed concerns over increasing foreign competition and uncertainty surrounding trade deals, such as the North American Free Trade Agreement. In the cattle sector, price variability is a primary concern, but despite larger inventories, prices and net margins are above year-ago levels. Sales of farm tractors and combines increased in 2017, up five percent and four percent, respectively. The association of Equipment Manufacturer’s latest monthly sales report found the sale of all tractors in the U.S. in December 2017, were up 18 percent compared to the same month last year. For the twelve months in 2017, a total of 220,500 tractors were sold which compares to 211,000 sold through December 2016, representing a five percent increase for the year. Sales of small two-wheel drive tractors increased five percent, but sales of 40-100 horsepower tractors declined two percent, and 100 horsepower and higher two-wheel drive tractors decreased seven percent. Meanwhile, four-wheel drive tractor sales increased 18 percent on the year. Combine sales were down three percent for the month. Sales of combines for the year total 4,112, an increase of four percent from 2016. Different strains of avian influenza were found over the holiday season globally, according to two global health agencies that say the number of human infections appears to have decreased over time. Meat industry publication Meatingplace reports that since December, the H5N6 strain of avian influenza has been reported in Hong Kong, the Netherlands, South Korea and Taiwan, in addition to H5N8 outbreaks in Italy and Russia. The World Organization for Animal Health says more than 32 million birds were lost or destroyed since its last report in September, and regional outbreaks include countries in Africa, Asia and the Pacific and Europe. Meanwhile, the World Health Organization said it found no new cases of human infection with avian influenza in the Western Pacific Region between the last week of December and the first week of January, in its latest update. A total of 238 cases of human infection were reported in the area since January 2003, with 134 fatal cases. Globally, there were 860 cases of human infection of H5N in 16 countries worldwide between January 2003 and December 2017. U.S. Farmers and Rancher’s Alliance board members have voted to not renew the contract of CEO Randy Krotz, the organizations only CEO since its inception in 2014. Farm Journal’s AgWeb reports USFRA’s Board of Director’s executive committee placed Krotz on administrative leave January 5th, and the board voted not to renew his contract on January 8th. In a statement, USFRA chairman Brad Greenway said: “We believe it is in the best interests of USFRA to seek new leadership going forward.” Greenway says a search for USFRA’s next CEO will begin immediately and that the organization has developed a plan with its staff to manage the organization in the interim. USFRA is composed of more than 100 farmer and rancher-led organizations and ag partners representing agriculture. The organization claims it is committed to helping increase confidence and trust in agriculture.